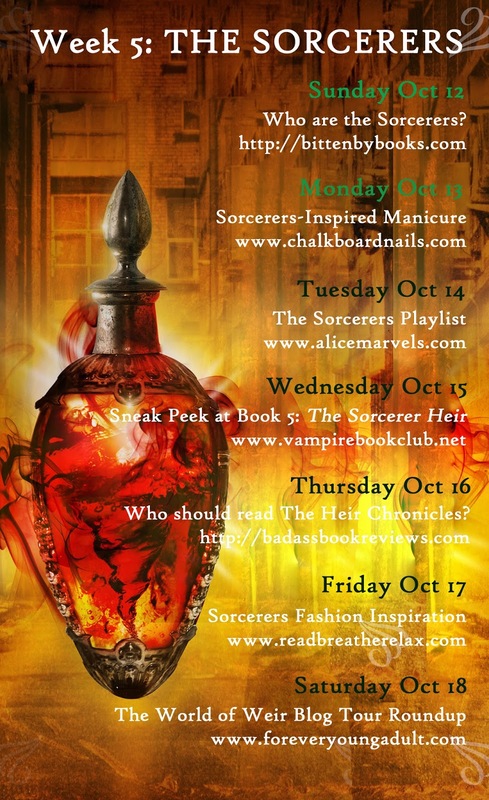 I'm happy to be a participant in the World of Weir Blog Tour today, leading up to the release of Cinda Williams Chima's new book, The Sorcerer Heir. Not only do I get to do some inspired nail art, but you guys get a new video tutorial! This magical, eerie smoke effect is really much easier than you might guess. The Sorcerers are masters of material - they can create magical talismans, potions, poisons, weapons, and more. They are also known for their healing ability, and have strong ties to the color green. In my tutorial, I've combined what I know about the guild with some inspiration from the book cover, which shows a potion with mysterious smoke swirling around it. 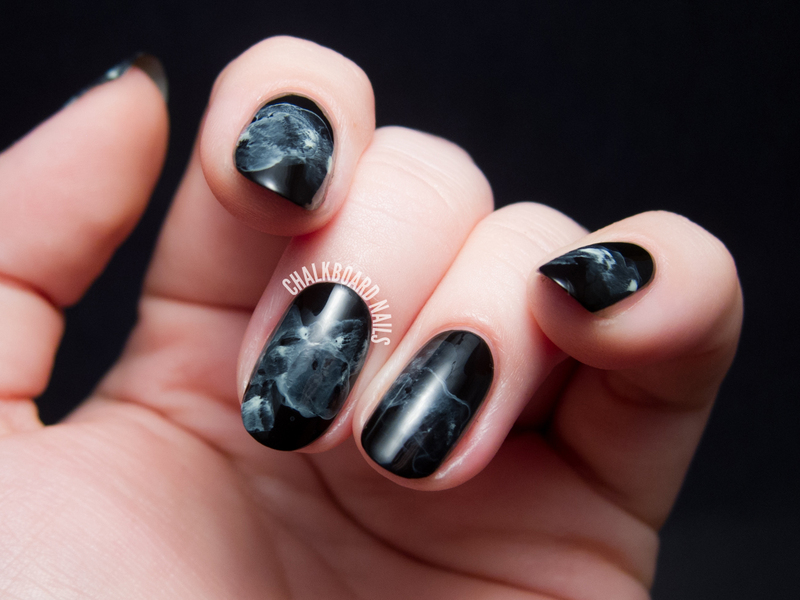 Who knows, you might even feel like a Sorcerer yourself with these nails! For this look, you'll need black nail polish, light green nail polish, topcoat, 100% acetone, and a nail art brush or two. Begin by painting your nails with two coats of black polish. Apply a generous coat of topcoat to protect the black polish before we move on to the next steps. Let dry. Using your green polish, paint loose, wavy stripes across your nails, roughly where you want your smoke to end up. Using a nail art brush to lightly dab 100% acetone over your green polish. Don't dab too much or too hard, otherwise the acetone may begin to eat through your black base. Repeat on all of your nails. I like to make it look like the smoke is most concentrated on my pointer and trails off as it moves towards my pinky. Clean up your cuticles if necessary using an angled brush and nail polish remover. For more information, visit Cinda Williams Chima’s Official Site, follow her on Twitter, and check out Disney-Hyperion on Twitter and Instagram. Hashtag #TheSorcererHeir to join the conversation. Disclosure: This post has been sponsored by representatives from Cinda Williams Chima's "The Heir Chronicles" series. Great to see a tutorial on this. There so cool! Love it! 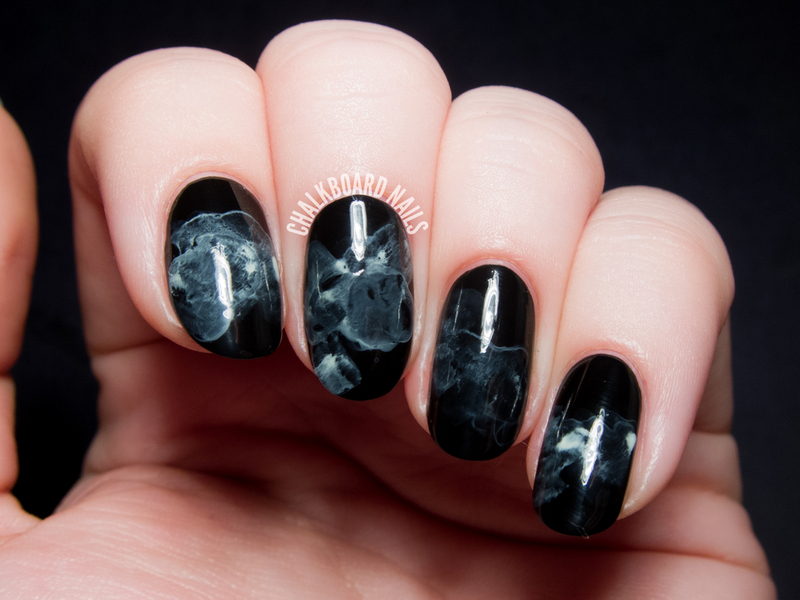 I recently did a smoke-effect nail art but I couldn't get this effect with nail polish+acetone: no matter how light I tried to be, I still managed to make a mess of my base (protected with a couple layers of seche, no less!). In the end I gave up and did it with watered down acrylic paint + a cotton swab to soak up the extra water. I loved the finished product but I'm still annoyed by how I couldn't get this technique right!! What is the point of using exactly green polish? If I use white, will it look worse? Haha yeah it took me a while but I finally did it! The green was meant to tie in with The Sorcerer Heir theme, you could use white no problem. :) I used white in my original version of this nail art. What I said out loud when I saw these..."That is so F%CKING cool!" Am I the only one who sees a creepy cartoony pig on the middle finger? Haha thanks! I can't say I see the pig myself, but isn't it funny how these are kind of like a Rorschach test? If you look at the middle top there are 2 eyes w/ ears on each side, then below that a large snout and below that is a mouth that's open...kinda looks like he's laughing? Can you see it now? Oh yeah, I can kinda see it! Creepy! Haha. Stunning, you do beautiful work. Just curious, how did you figure to use pale green polish for the smoke? I never would have guessed that mint green was used to get a smoke color. Did pale grey, which would be the natural assumption not work? So beautiful! I have visions of all kinds of colour combinations for this method! Thanks for sharing! Brilliant! I love your smoky nail art the first time you did it and have wanted to recreate it ever since. The tutorial gives me a little more courage to try it! So gorgeous! I've never really found a way of making my nails stand out without mucking it up, this has really put some inspiration back into the idea for me :D Great work, love it! 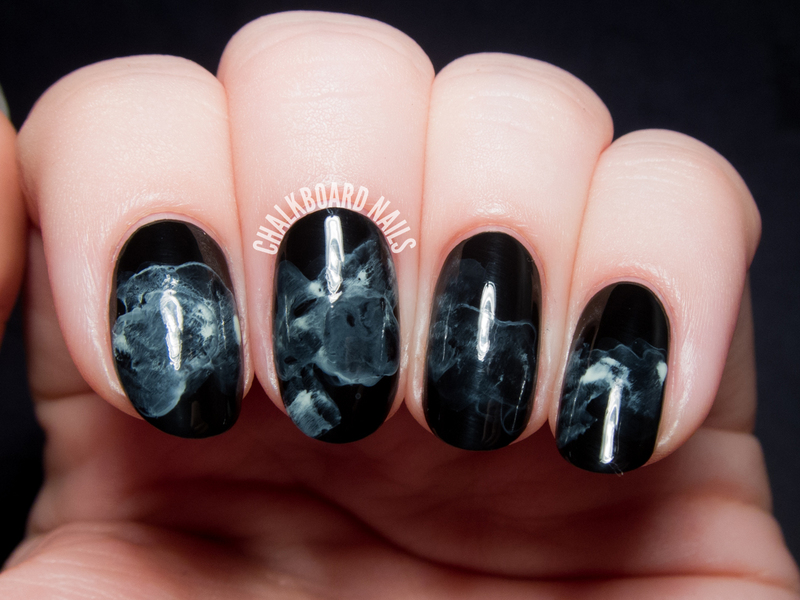 I have not heard of this book series before, but I totally love the look of this smoke manicure! Love this SO much, definitely going to try it. Thank you for the tutorial. We often get inspiration in Blogland, and use it at our blog. Thanks! This just blew my mind, trying it tonight!! Wow. Did you discover that technique yourself? Haven't seen anything like it before. When I originally did this, the watercolor effect was pretty popular but just for small dots, not for a long billowy effect. So I repurposed it! It worked! I'm Very Bad at nail art but this was pretty much foolproof, it even looks good on my right hand. I think the pastel green I have is a little too green so I might try a pure grey next time but you're exactly right--it's perfect for when you need something to be both seasonal and a little subtle. These are amazing!! I love how spooky and mysterious it looks, definitely going to give this a try! So awesome! Definitely going to try this ^^. Wow I'm shocked at how simple this is... I absolutely love this tutorial!! Can you try this with different couloured nail polish to get the same effect? Yes, just make sure it's a light or bright color on a dark base to get the effect.